Everyday cooking means taking lots of shortcuts. For the most flavor with the shortest amount of time in the kitchen, especially when you’ve splurged or gone out of your way to buy good ingredients, it’s a delicate balance between paying attention to the details and just trying to get dinner on the table. We’ve all done it — cooked tomatoes with their peels and seeds, served pureed soup unstrained, fried the potatoes just once, not twice. It’s healthier, right? As a cook, I embrace shortcuts. But as a cooking teacher, I always try to explain to my classes why, over the centuries and millennia, certain techniques have developed. Sometimes it’s cultural. Usually, though, there’s a very real change in texture or flavor, nutrition or shelf-life. Two simple techniques increasingly omitted from recipes now are salting eggplant and browning butter. Neither are absolutely necessary. Both, however, are worth doing every once in a while to remind yourself just what amazing flavors you can create in the kitchen. 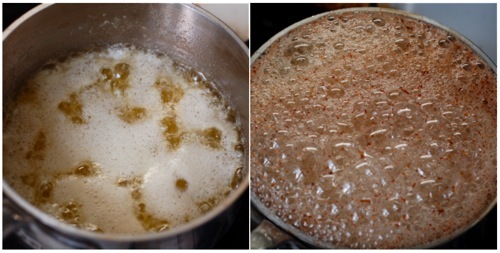 Simmering whole butter until all its water bubbles off and its protein solids separate accomplishes several key improvements. It allows the butter to sit at (tropical) room temperature much longer without turning rancid. It significantly increases the butter’s smoke point to allow high-heat cooking. And it transforms the milks sweet flavor, adding deep, nutty, caramel tones. Indians call it ghee, while the French call it beurre noisette, or hazelnut butter for its rich color and flavor. You need just five or ten minutes to make browned butter. Melt good-quality, unsalted butter in a small, heavy pan over medium heat. (A lighter colored pan will allow you to judge more easily the color of the butter as it cooks.) Continue cooking it through the foamy bubbling stage, while all the water evaporates off. Reduce the heat if you want to give yourself some extra buffer time, especially if this is your first time browning butter. 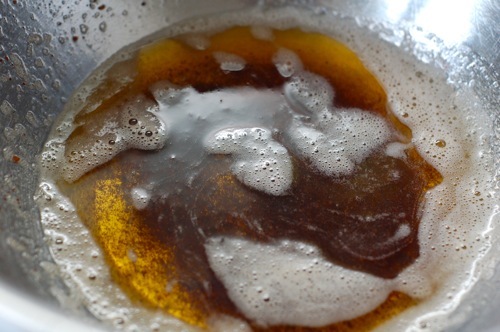 As the bubbles subside, swirl the pan occasionally and keep an extra close eye on the butter. The protein solids will sink to the bottom. When they turn light brown, transfer the hot butter immediately to a heat-proof bowl. Be sure not to scorch the butter, as blackened protein will taste sharply acrid, not pleasantly nutty. It will darken a little more as it cools. For frying or long storage, be sure to separate the milk solids: skim off any remaining foam and spoon or pour off the oil while still liquid, leaving behind the darkened protein at the bottom of the bowl. Browned butter can be used while still melted to saute or to garnish. It’s excellent for vegetables like asparagus, broccoli, and green beans. If you’re trying to use less butter, deepening its flavor will accentuate the effect from smaller amounts. For a super simple yet elegant entree, sear chicken breast, pork chops, or fish fillets in browned butter and then serve with fresh lemon wedges. Let browned butter solidify and substitute it in baked recipes for extra delicate cookies and cakes. (Remember that less water means less gluten development in flour, so be sure to allow for some trial and error as you figure out the fulcrum point between flavor and structure.) Use it in rice pilaf to serve with full-flavored stews and roasts. Or simply offer it at the table in your regular butter dish and spread it on crusty bread or flaky biscuits for a flavor epiphany. With ever smaller, younger and fresher vegetables making their way to our markets in the past decades, old rules have lost much of their imperative. Peeling, trimming, salting — these were techniques required when vegetables were allowed to mature completely on the plant, transported long distances without the benefit of refrigeration, and served within weeks not days of harvest. Tender carrots no longer require peeling. Young celery stalks can be cooked with leaves. And most eggplants now, especially the narrow Asian varieties, are fine going straight from the cutting board to the pan. Occasionally, though, salting eggplant is critical and will remind you just why this vegetable has been embraced in classic dishes around the world. It’s a hassle, but the extra step draws out bitter juices in older vegetables, whether those missed in the back corner of your garden or forgotten in the bottom of your refrigerator. More importantly, salting alters the cell structure of the vegetable’s flesh, creating that famous silken texture while preventing excess absorption of oil. To salt eggplant, halve, dice or slice it as needed. Sprinkle generously with kosher salt and set aside in a bowl or colander. To encourage the purging of juices, weight the eggplant. (The most effective way is to fill a zip bag with water and plop it on top of the pieces. The age-old method is a flat plate topped with a rock.) Leave the eggplant for 30 to 60 minutes. When you return and peek into the bowl, you’ll see a surprising amount of dark brown liquid at the bottom. Rinse the eggplant quickly in cool water, drain well and then dry it by wringing in a clean cloth or patting with paper towels. Salting eggplant will noticeably improve recipes that call for stuffing eggplant halves or rolling thin slices around a filling. It’s also a good technique for dishes where keeping its shape is important, such as stews, curries, ratatouille, or parmigiana. 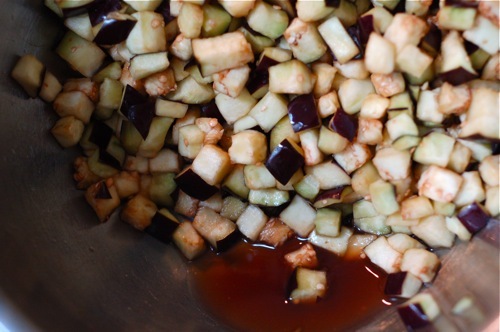 If you’re deep-frying eggplant, salting is essential for preventing greasiness. And what if you’re making baba ganoush or using tiny, little adolescent eggplants? Nope, no one will care or notice if you skip the salting. Cooking is an investment of time and money, energy and love. Like all decisions, judging the costs requires knowing the benefits. And then choosing wisely. I love beurre noisette. I often use it for flavoring croutrons for soups. Absolutely divine nutty aroma. I’ll try this out with eggplants. Delish!